Description: Clip art photograph of U.S. Air Force Staff Sgt. Stephen Ingrando, left, and Tech. Sgt. 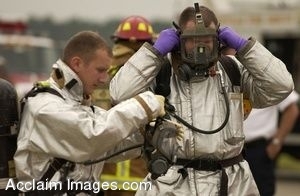 Jeffrey Snyder, both firefighters with 125th Fighter Wing, Florida Air National Guard, suit up to triage and recover victims during the tri-annual mass casualty exercise at the Jacksonville International Airport, Fla., Oct. 18, 2006. (U.S. Air Force photo by Staff Sgt. Shelley Gill). Clipart photograph by Department of Defense Public Domain.